Michael Daugherty has 20 concertos to his name and this highly enjoyable Naxos disc draws together three of his most recent. 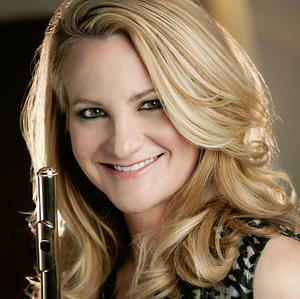 In the flute concerto Trail of Tears, Amy Porter is in scintillating form. Daugherty insists on every flute technique available, a challenge to which this flautist responds with fluency and feeling. That said, she – and the piece – wear their virtuosity quite lightly, so the deeply expressive nature of this music is never compromised. As for the orchestral writing, it’s both eloquent and forceful, and that creates a compelling soundscape. Three concerted works grace the program, each a world unto itself. The soloists for the works are near ideal exponents; the orchestra very well situated and fully rehearsed to give a precise, impassioned and nuanced reading of the music. BSO opens the new season with exciting soloist, Beethoven's 'Eroica"
"There was wonder in both halves of the concert, beginning with Porter’s unique technique, raising the question, “How did she do that?”"
"Porter rocked back and forth as she played, jabbing the melody back and forth between the orchestra with such precise timing, it was as if she’d been performing in Billings for years. Porter and the orchestra drew a much-earned sustained standing ovation at the end of the piece." Amy Porter was the marvelous flute soloist in "Trail of Tears," another colorful and evocative concerto from Michael Daugherty, the ASO's composer in residence. His title refers to the forced displacement of Cherokee families by the U.S. Army in 1838. Sadness and anger could be read into the first two movements, which included some breathy sounds and sagging pitches in the flute. But tragedy was never really at the forefront. The focus remained on Porter's beautiful tone color and Daugherty's imaginative deployment of the orchestra, with a generous use of rattling and shaking percussion instruments. The melodies were beautiful, the extended techniques such as bent notes and flutter tonguing were very effective. Porter's technique was flawless, even in the "wildly difficult" finale [...] Porter got a standing ovation and several curtain calls. "An unusual take on music from the past... an impressive transcription by flutist Amy Porter. Impressive playing!" "There’s a difference between playing the notes of a piece, and having the music come from somewhere deep within, and Porter most definitely does the latter in this work." "Porter’s arrangement of Bach’s Prelude from his solo Cello Suite No. 5 in C minor was done with great passion. Flutists don’t have this type of piece in their libraries, so this arrangement is a welcome addition. Itís very challenging and dramatic, but satisfying to perform." "But her [Amy Porter's] gleaming, lyrical reading of these profoundly personal works [Bach's Cello Suites] feels more like a distillation that concentrates and heightens their melodic structure." She has a vibrant sound and excellent control over the breathing, the wide intervals she plays, and the intonation. Amy Porter plays with feeling and clean, seemingly effortless articulation...[T]his unusual recital is one any lover of conservative modern melodic music for flute and piano should enjoy. Above all, the performances [on American Art] are a flawless collaboration between flutist Amy Porter’s confident and authoritative artistry and Christopher Harding’s superb work on the piano. "...soloist Amy Porter - a member of the Michigan flute faculty and a Juilliard graduate - is fantastic!" ...soloist Amy Porter deeply imbues her performance [of Michael Daugherty's "Trail of Tears"] with a sense of narrative and of speech and, yes, drama. Daugherty, a member of the [University of Michigan] faculty, made the work for his colleague Porter, and she wears it like a glove - or perhaps it wears her. The haunting melody with which she opens the piece, and which dominates the first movement, turns from blue sky to black clouds in an instant with the entrance of the orchestra. The sudden transition is overwhelming: peace turned instantly to turbulence. Bent notes and trills convey a sense of Native American music and the natural world. We hear birds, we hear hoofbeats; ankle bells jingle and rattle sticks rustle; drums and flute talk back and forth. A middle movement radiates a quiet, determined acceptance that ascends to wild outcries over an orchestral drone. Thrillingly, the flute melody of the first movement returns in the last - transformed into pure breath with pitch, a sort of hoarse, urgent cry for what once was. Following a performance of Jacques Ibert ‘s Concerto with the Houston Symphony, the Houston Chronicle praised her performance stating: "She also was an exuberant, easily extroverted performer whose enthusiasm for the music made the composition sparkle."